Turbulence.org Commission: Global Direct by Paolo Cirio: Promoting global, participatory democracy Global Direct is a political philosophy driven by information technology and the failure of current political systems to respond to the complexities, crises, and speed of contemporary life. Inspired by the tradition of utopian artistic visions, and informed by extensive research, Cirio’s fifteen organograms illustrate alternative protocols, procedures and policies for actualizing a global democratic system. On the website you will also find an invitation to “Suggest a Slogan,” video statements by prominent advocates of participatory politics, and more. 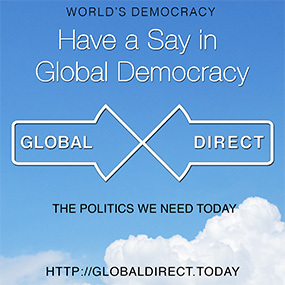 The slogans and printed posters of the Global Direct campaign will be disseminated through social networks and in physical public spaces. Global Direct showcases how distributed networking technologies can be used for participatory decision-making, transparent accountability, and civil awareness. Global Direct is a 2014 commission of New Radio and Performing Arts, Inc. for its Turbulence.org website. It was made possible with funding from the Jerome Foundation, now celebrating 50 years of the creative spirit of emerging artists. Additionally, Global Direct is supported by DOX Centre for Contemporary Art, Prague, Czech Republic; and Lunatici Cultural A.P.S Association through the Municipality of Parma, Italy. Paolo Cirio is an Italian contemporary artist based in Manhattan. His projects have tampered with institutions such as Facebook (Face to Facebook, 2011), Amazon (Amazon Noir, 2006), Google (Google Will Eat Itself, 2005), Nato (Anti-Nato Day, 2002), and the financial industry of the Cayman Islands (Loophole For All, 2013). He renders his conceptual works through performances, photos, drawings, videos and installations. Cirio’s work has been presented and exhibited in major art institutions, including Victoria and Albert Museum, London, 2014; TENT, Rotterdam, 2014; Museum of Contemporary Art, Sydney, 2013; ZKM, Karlsruhe, 2013; CCCB, Barcelona, 2013; CCC Strozzina, Florence, 2013; Museum of Contemporary Art of Denver, 2013; MAK, Vienna, 2013; and Architectural Association, London, 2013. Cirio has won a number of awards, most recently a Prix Ars Electronica Golden Nica (2014). He has also curated panel discussions for The Kitchen (2012) and Eyebeam (2013) in New York City.